A solid, straightforward bass enhancer with Universal Audio's usual attention to detail and slick sound quality. Useful instrument-focused modes. Simple solution for improved bass. DSP-efficient. Very helpful solo options. Can sound artificial at times. Doesn't work in every situation. No UAD 1 version. The headline plug-in for the 5.6 update to the UAD DSP platform is clearly the Manley Massive Passive. 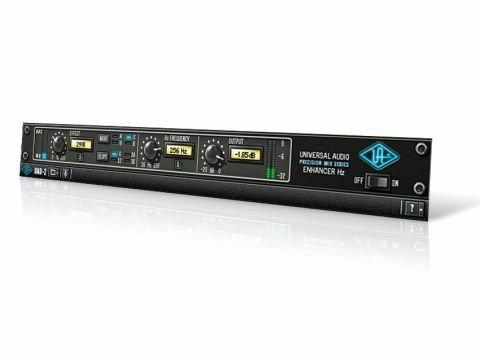 However, UA also slipped in this low-frequency enhancer, which might have escaped the attention of some, especially since it's easy to mistake it for its treble-enhancing older sibling, the Precision Enhancer kHz. Precision Enhancer Hz (PEHz) introduces low-frequency harmonics, enhancing the bass fundamental and making the low end more audible, particularly on smaller speakers. The underlying concept is pretty straightforward and combines a low-pass filter with a selection of material-tailored modes. The filter offers four slopes (6, 12, 24 and 36dB per octave) and is freely adjustable from 16Hz to 320Hz. As for the modes, they give you five flavours. To get the most out of Precision Enhancer Hz, you need to set the mode appropriately. The first two settings are aimed squarely at bass guitar: mode A adds low-end emphasis for acoustic and electric bass, while mode B is even more specific and is designed to help bring out DI/electric bass in the mix. The three other modes all apply some compression to the harmonics signal, changing its timbre and increasing its level. Mode C is said to be fit for synth bass, bus processing or full mixes, while mode D has a short decay that's intended to make it suitable for kick drums and percussion. Finally, the All mode has a similar frequency curve to mode A, but produces a much stronger, more audible effect. In use, we were surprised at how well the modes fit their intended purposes. Modes A and B give predominantly second and third harmonics, while in modes C and D, higher harmonics were also present. Beyond this, PEHz includes a processing level control (0% to 100%) with a blue 'effect' meter to indicate the enhancement strength. You'll also find solo options for both the filter and effect sections (so you can listen in on their behaviour) and a simple level trim and meter on the output. The Effect parameter isn't a dry/wet mix control but instead drives the signal into the enhancer effect stage, so the degree of processing will be dictated by this and the incoming signal level. Taking our lead from the modes' intended uses, we tried PEHz on electric bass (modes A and B), synth bass (mode C) and kick drum (mode D). This was very enlightening, and the solo options allowed us to easily discern the differences. The cutoff point and slope influence things greatly. For example, in mode A, with a cutoff around 120Hz, electric bass gains bottom-end weight. But shift it up to 300Hz and the lower mids are far more dominant, although the low frequencies are still enhanced. Mode B is more restrained, even with a high cutoff point. Using mode C with synth bass produces more aggressive results than the first two modes, and sweeping the frequency control at high slope settings gives the impression that the effect is applied in a band-pass manner. Finally, mode D on kick drums produces excellent results so long as you keep the cutoff low - push it much higher than 150Hz and you'll notice the upper harmonics. The All mode also works great with kicks, sounding like mode A with more edge. We tried PEHz on other sounds, such as acoustic guitar, piano and sub-mixes, including stereo drums. The more complex the sound, the more we opted for subtle enhancement, and there were times (eg, with acoustic guitar) when we couldn't improve things. PEHz can struggle with complex sustained sounds and success lies in choosing the right mode and dialling in the cutoff frequency. We were happier processing individual sounds, although we did have success bolstering low frequencies in a stereo mix. Precision Enhancer Hz is a good effort and is the sort of processor you think you don't need… until you really need it! It's also DSP-friendly, giving 38 mono instances on a UAD 2 Solo, but UAD 1 owners might be irked that - unlike the rest of the Precision range - it's UAD 2-only. 1. Electric bass: In mode A, first bypass, then switch in effect solo and add 50% process, then sweep up filter from 16Hz to 320Hz. Switch out of solo. Then solo again and choose frequency. Now drive input more and bypass to compare a few times. Next the same process but in mode B. 2. Synth bass: In mode C with slope 36, bypass then switch in effect and sweep up in solo mode. Switch slope to 24, sweep down, switch slope to 12 sweep up then to 6 and sweep down. Now adjust effect, switch slope to 24 then 36 and re-adjust cut off point. Bypass to compare. 3. Kick drum: In mode D with slope 36 gradually increase effect to about 60% then reduce frequency to show effect. No switch between various slope options then bypass to compare. Increase effect level. Now switch to 'all' mode and adjust frequency. Bypass to compare. 4. Drum kit mix: Set slope to 24 and frequency at full, increase effect to 70% then switch through modes from A to D then 'all'. Reduce frequency for right effect then bypass to compare a few times. Now reduce frequency further and do the same again. Adjust levels and bypass to compare.